Dinosaurs are cool and can be found in artwork all over the world. Nearly everyone is at least partially interested in these extinct creatures who lived millions of years ago. It is part of why they live on in illustrative prints, books, and movies. Lots of people are familiar with some of traditional dinosaurs like Tyrannosaurus Rex, Stegosaurus, Brachiosaurus, Triceratops, and the flying Pterodactyl. These species are easily recognizable but there are hundred of others out there like Corythosaurus casuarius, often shortened to just Corythosaurus, that deserve recognition too. Corythosaurus casuarius is a member of the Hadrosaurus family among the late great dinos. These creatures are more commonly known as duck billed dinosaurs. They flourished during the Cretaceous period, 75-80 million years ago, with their territory covering much of North America, particularly in the Midwest and up into Canada. Typically a full grown Corythosaurus casuarius could reach up to 35 feet long from the tip of the nose to the end of the tail. They were herbivores with hundreds of teeth perfect for chewing and grinding plants much like you would see in a cow today. Since their initial discovery in 1912, numerous examples and complete skeletons have been found allowing for their display in museums all over the world. 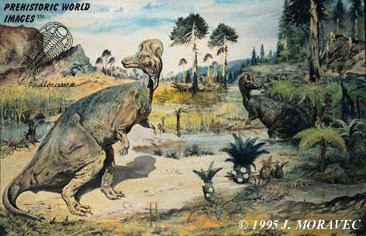 Paleo artists like Josef Moravec, who painted the original oil for this print, love using this dinosaur to make Corythosaurus casuarius printsCorythosaurus casuarius print is that this is one of the few species of dinosaur to have been found in a mummified fossil form, which give artists an idea of what the skin texture was like and to some extent the coloring. Artwork portrayals of the Corythosaurus can be downright beautiful and when done correctly, not need to look cartoon-like. Josef Moravec’s painting of Corythosaurus casuarius captures the beauty of this very recognizable dinosaur and the world in which it lived in this classical style rendering. Prints such as these are great for wall decor in museums, schools, and in a dinosaur loving kid's bedroom. It is hard to pass them up when they look so nice and are full of life and color. For people who like dinosaurs, nice prints and other artwork portraying them isn't always that common but it is fairly simple to find, especially online. Whether you are looking for a piece of art featuring the famous T Rex or a lesser-known dinosaur like Corythosaurus casuarius to grace your walls, it can be found out there. It is even available for sale for a decent price without breaking your bank account. Dinosaurs are cool and most people think so too. There is no reason that anyone should be stopped from displaying dinosaur prints as wall art. It's educational science and history on exhibit and something that anyone would enjoy learning about.